I have a lot of volumes mounted in my desktop(just about 20!). I really hate to see my desktop being cluttered with the mounted volume icons. So, What do I do with them ? I just hide them! If you are like me, and want to stop GNOME from showing up the mounted volume icons on your GNOME-desktop, here is the trick! this should open up "Run Application" dialog box, enter "gconf-editor" in this and press enter. open Terminal from Applications->Accessories. and type "gconf-editor" and press enter. First Step should launch a separate application named "Configuration Editor". This is the front-end to the settings of different GNOME applications. This is more or like registry editor or regedit in Windows. here you will see many key value pairs. We are interested in a key named volumes_visible, uncheck the check-box in-front of this key. That's it! P.S. If you are interested you can play with rest of the nautilus settings. From same place you can show/hide Trash icon, Computer icon and Home icon from your desktop. Also, you can change the name of the Computer icon and Home icon. 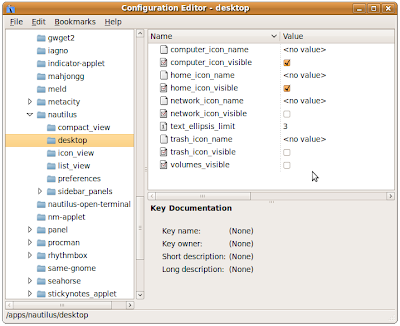 Technorati tags: GNOME, GNOME Hide mounted volume icons from desktop, gconf-editor, Changing nautilus settings.